A 7-night 8-day trek through rugged terrain with a close-up view of the Jhomolhari and other mountains. The highest pass is 4,090 metres above sea level. Meet the semi-nomadic people of this regions. Trekking days average 8 hours a day. The Jhomolhari Trek is a beautiful and exhilarating trek. After a day acclimatizing in Paro your 8-day trek begins, taking you over several passes that almost touch 5,000m. Daily hikes last about 8 hours with a day-halt for acclimatization at the Jhomolhari base camp (and another optional day’s halt at Lingshi, high in the mountains, between two passes). This route takes you over the 4,890 metre Nyile-La and on to Lingshi Dzong (4,370) before turning in the direction of Thimphu via another high pass. This is an excellent, challenging trek with great views of the high peaks. Depending on weather conditions, yaks take over from ponies for the journey beyond the base camp. The route that descends towards Thimphu begins as high pastures and gradually narrows as you follow the river and the valley past amazing rock formations and through ever-thicker forests. The trek ends in a valley near Thimphu. On your return from the mountains, enjoy the beautiful landscapes and varying climates of Thimphu, Paro, and Punakha and visit the cultural highlights of Western Bhutan. Visit impressive monasteries and temples where Tibetan Buddhism flourishes and red-robed boy-monks chant their prayers. The huge Dzongs are the uniquely Bhutanese feature of every town. Enjoy watching traditional craftsmen and women at work on wooden items, statues and complicated textile weavings. Relax, unwind, chat with the locals, take photos, and browse in the shops. Arrive Paro & transfer to hotel. Afternoon visit the impressive Rinpung Dzong and other sightseeing depending on your time of arrival. country roads to Drugyel Dzong. In the afternoon you have the option to hike along some country roads on the way to your first campsite or you can drive directly to Shana for dinner at the camp and overnight in a beautiful open space surrounded by blue pine forest. Trek -Shana – Soi-Thangthangka (16 km, 8 hrs, 3,580m. highest altitude). This is one of the longest trekking day, with a steady rise in altitude. The trails pass through a mixed forest of blue pine and oak and tall rhododendron forests. At various points along the trail you will be able to enjoy the view of Jhomolhari Mountain. Soi Thangthangka – Jangothang (11km, 4hrs, and 4,000m highest altitude) Today’s trek is short and unstrenuous. 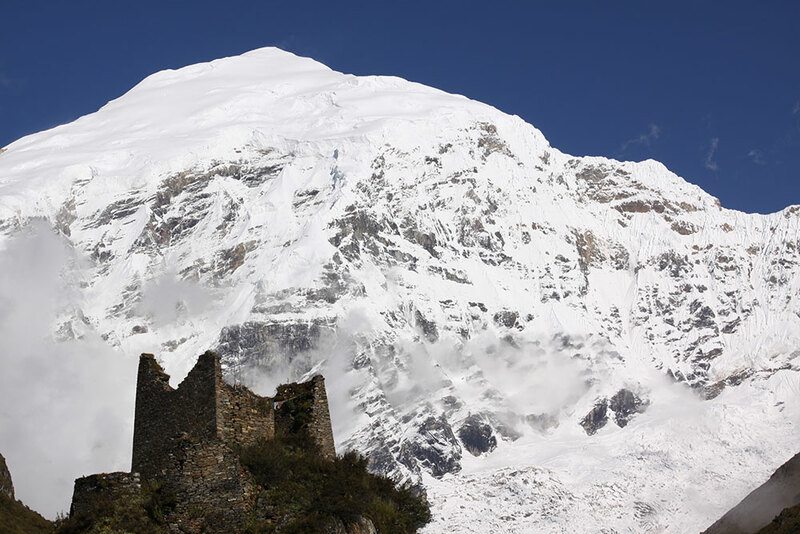 Your base camp is directly below the imposing, rounded bulk of the Jumolhari mountain and the evening profile of the ruined Jangothang dzong, populated by huge ravens, creates a mystical atmosphere. the top of the mountain overlooking the camp and the glaciers beneath Jumolhari. You can also see the pointed Jichu Drakey piercing the clear blue sky.It is worth waking yourself up in the middle of the night to observe the quantity of stars not usually seen from our cities. Today’s hike is a strenuous one. Climb steeply above the base camp and into an area of glacial moraine, with views of Jichu Drakey and Jumolhari until you reach the Nylie-La pass at 4,890m. A fairly tough trek over scree or snow leads down to the valley and then follows the side of a ridge towards the impressively situated Lingshi Dzong (4,370m) and the camp site, at an altitude of 4,000m. Today’s hike is long and difficult, crossing the river the ascending towards the Yele-La (4,950m). It takes 2 – 3 hours to reach the pass from where there are views of the high Himalayan peaks. The descent to the campsite in a meadow at Shodu (3,815m) is quite pleasant. most of the day, criss-crossing back and forth over log bridges and passing through an area with steep rock faces and beautiful waterfalls. After crossing to the left bank the trail then ascends towards the ruins of Barshong Dzong (3720). Today’s trekking is of moderate difficulty but mostly downhill and of a fairly long duration. The trail follows the Wang-chu river and starts with a gentle descent but then gets quite steep and rocky, with many steep cliffs and huge rock formations above you. There are several ridges and streams to cross during the day. The final leg of the trek twists and turns and rises and falls, following the Wang-chu most of the time. After reaching a pass at 3,510m the very steep and continual descent starts towards Dodena where the trek ends. Drive to Thimphu (40 mins) for a well-deserved rest and free time in town. Spend your time in Thimphu visiting various cultural sites and relaxing in this very small city. Visit the Chang-gangkha temple, Takin reserve, the Folk Heritage Museum and the huge outdoor Buddha. Finally, visit the impressive Thimphu Dzong (Trashichodzong). You should have some time for shopping, browsing and, perhaps making an original stamp with your own photo on it to send your postcards home. Morning sightseeing in Thimphu. Visit the Institute for the 13 Traditional Arts (Zorig Chusum) and the Textile Museum and take a stroll to the Memorial Chorten. In the afternoon drive towards Punakha (2½hrs). Stop at Dochula pass (3000m) to circumambulate the 108 stupas (chorten) and enjoy the view of the high Himalayan peaks. In the morning take a pleasant hike up to Khamsum Yuelley Chorten for great views of the wide river valley. On your return, visit the Punakha Dzong. This was the former capital of Bhutan and is an imposing structure, with a very impressive temple. Also visit the nearby exhibition recounting in pictures the reconstruction of the original cantilever bridge. After lunch overlooking the rice fields or the river, take a very short stroll through a village and rice fields to Chimi Lakhang (1,200m), the temple of 15th Century Lam Drukpa Kuenley, the “Divine Madman”. You also have an option to book a short rafting trip in Punakha. Drive to Paro (3½hrs). En route visit Simtokha dzong, the first dzong established by the Shabrung in 1629. On the last stretch of the route towards Paro stop at Tamchog Lhakhang and cross its iron-chain suspension bridge. Free time in Paro. Early in the morning hike to Taktsang Monastery, the famous “Tiger’s Nest” perched on a precipitous 1,000m cliff face. The round trip takes about four hours and there is an option to ride on horseback to a point relatively near to the top. Spend the afternoon at leisure in town. After breakfast, transfer to the airport for your flight departure from Paro. Tashi Delek! Only in the peak trekking months from late March to late May and from mid-September to early November.